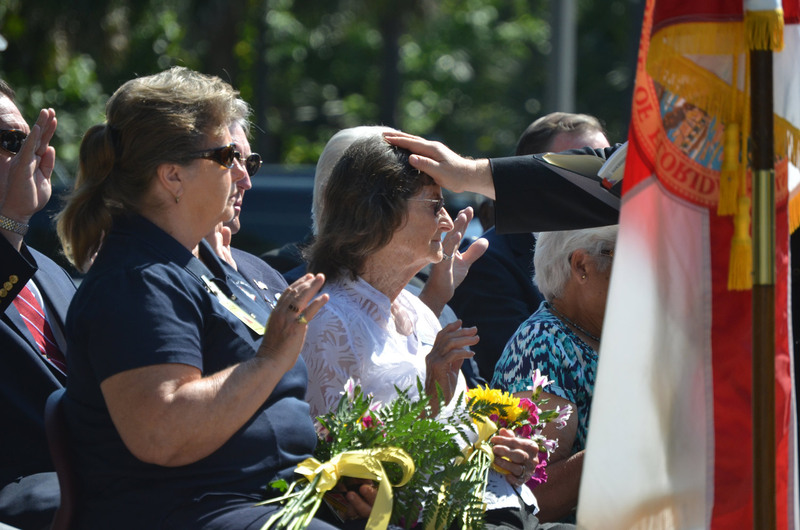 “What is the meaning of ‘In the line of duty?’,” Rick Staly, Flagler County’s undersheriff, said during his brief remarks at the annual commemoration of fallen law enforcement officers at the Flagler County Sheriff’s Office this morning. An average of 155 law enforcement officers a year are killed nationwide. So far this year 41 have been killed in the line of duty, 16 of them by gunfire, 15 of them in auto-related incidents. Two have been killed in Florida: Joseph “Shane” Robbins of the Polk County Sheriff’s Office, who died on April 13 in an auto accident. Ad Sgt. Gary Morales of the St. Lucie Sheriff’s Office, murdered on Feb. 28 when, while making a traffic stop, the man he was stopping got out of his car and shot him. They are recognized during National Police Week in June, and locally, a few weeks ahead of that commemoration in Washington, they are recognizeed in a brief ceremony in front of the sheriff’s office’s operations center in May. Aside from numerous elected and appointed officials, the family of Chuck Sease was present today. 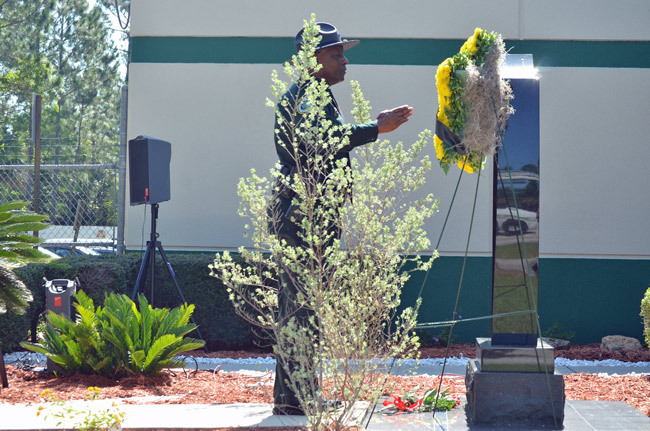 Sease, then 35, is the last Flagler County law enforcement officer to die in the line of duty. It happened on July 5, 2003, when Sease attempting to deploy stop sticks during a chase and his killer’s car struck him on an I-95 exit ramp in Flagler. That death took place on Jim Manfre’s watch, who was sheriff at the time, and made note of it today during his speech, his first on such an occasion since being elected sheriff again last November, when he defeated Don Fleming. Fleming was in the audience, his first appearance at a public event since November. “Just here to pay my respects,” Fleming said, adding that in the last few months he;d done “a couple of consulting jobs up north,” but otherwise has remained to himself. In his remarks, Manfre read the account recalling his childhood’s first memory of an encounter with a law enforcement officer, when a knock at the door was followed by the officer’s announcement that Manfre’s father had been in a serious car wreck because of a drunk driver, but would survive. What a fitting tribute to the fallen doing their duty. The ultimate sacrifice. Nobody is promised tomorrow. God bless their families. I can sympathize with Sherriff Manfre’s duties at being “a greif counselor”. This is probably due to lack of practice, as the facts show, Officer Seace (RIP) was the first officer in Flagler County to die on the job since 1928! And about one half of all those Police deaths were from automobile accidents. So I do not mean to denigrate your service or contribution to our society’s safety or show a lack of appreciation for your service, but a lot of men and women die on the job. Roofers, Electricians and others also contribute to society and die on the job at too high a rate. The statistics do not make your service all that special. Why does the Government and media feel the need to push you professional sacrifices as being more worthy than that of any worker? Why the special agenda? The job you do should be appreciated. As should all of them. Kudos to Fleming for coming to pay his respects. At least HE didn’t try to make the day about himself. Those that have paid the ultimate price don’t get many moments in the sun. The phrase means faithful unto death. It also may be translated as faithful til death, or faithful until death. It’s the motto of the New York Police Department, and shows the level of their commitment to their city and its people. NortonSmitty, No disrespect to all those killed on the jobs you have listed, but none of those jobs are you REQUIRED to risk your life to help others. When people are running away from danger, the men and women of police and fire departments are running towards the danger. And you are right about the car accidents, but it is because they are traveling at higher rates of speed or rushing through congested areas to help some one in need. There is a huge difference between those deaths of the professions you have listed and I am glad we honor those that sacrificed themselves so others will live.